There is not any report a profile service on Plenty of Fish but there are still ways to do it on the website. In this page, we are going to tell you how to report POF fake profiles… So you will easily contact to the staff of the website and let them know who is cheating and who has created a fake profile. If you have any questions regarding reporting POF fake profiles, please leave a comment this page. See Also: Is Fake POF Account Illegal? There is Not a Report Button in POF? Go to the profile you want to report. Copy the url of his/her profile. Visit this page to contact POF staff. Type your registered mail to Plenty of Fish to the email field. In the regarding field, you will need to select “Report Profile/User”. In the message field, paste the url of the profile, write why do you think that the account is fake, also write username of the fake profile owner. Now you reported the fake profile to the staff. It is highly likely that, they won’t respond your request. However they can take action against that profile at incoming days. We recommend you to be patient about this. Websites like POF has too much users and they can’t answer their users immediately. Unfortunately this feature is not available on POF at the moment. When you visit a profile, you won’t see any report button on that page. 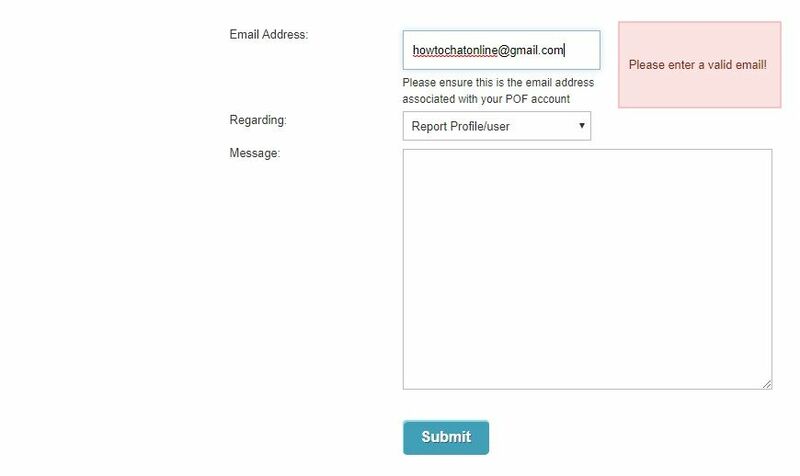 You will need to do the report POF fake profiles thingie with the steps we have told you above. You can’t report an account because you are suspicious about this though. There should be some evidence that those accounts are fake. Otherwise this won’t work for you.